I started folding the love seat, and then the armchair. They ended up being so cute that I couldn't help building a complete living room around them! I had a lot of fun looking for models that I could use to complete the room. I built the room (floor and two walls) with cardboard and scrapbook paper, but I think this living room will look lovely in a real dollhouse. The hardest model to fold was the ore, which is the modular decorating the table, not because of the difficulty of the foldings, but because I used small squares of paper. Love seat, arm chair and cushions, created by Paolo Bascetta. 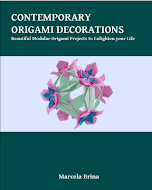 The instructions can be found in his book, Origami, ISBN 9788873870258. I folded the them with double-sided scrapbook paper. I used a 6" (150 mm) square for the love seat, a 6" x 4½" (150 mm x 113 mm) rectangle for the armchair, a 3" (75 mm) square for the top of each cushion and a 2¾" (69 mm ) square for the bottom part of each cushion. Bookcase. As a bookcase, I used a traditional masu box with a minus divider created by Bob Voelker (more information here). I used 6" (150 mm) squares of scrapbook paper. Books, created by Tomoko Fuse. The instructions can be found in her book, 12 Months in a Small Box - Autumn Winter, ISBN 9784480873408. 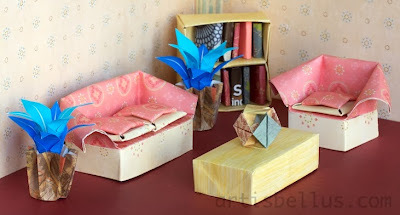 I folded the books with scraps of origami paper, copy paper and magazine paper. I used a 3"x 2" (75mm x 50 mm) rectangle for the cover of each book, and strips 1¾"(44 mm) wide, of different lengths, for the sheets of the book . Table, created by Yoshihide Momotani. 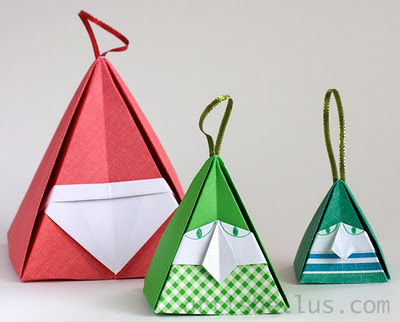 The instructions can be found in his book, Doll's House with Origami, ISBN 9784426301050. I used a 6" x 4½" (150 mm x 113 mm) rectangle of scrapbook paper. Ore, created by Toshikazu Kawasaki. The instructions can be found in his book, Greatest Dream Origami, ISBN 9784255005058. I used six 1½" (38 mm) squares of origami paper. Potted plants, traditional models (more information here and here). I used 3" (75 mm) squares of origami paper for the flower pots and the flowers.